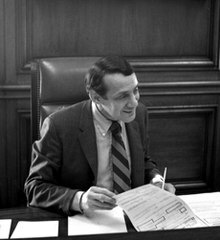 Polaiteoir Meiriceánach ab ea Harvey Bernard Milk (22 Bealtaine 1930 – 27 Samhain 1978). Bhí sé ionad aige ar Bhord Mhaoirseoirí San Francisco, an chéad duine LADT a toghadh do oifig phoiblí i gCalifornia. Níorbh iad an pholaitíocht agus gníomhaíocht aerach na haon suim dá raibh aige: Bhí 40 bliana slánaithe aige sula ndeachaigh sé le ceachtar den dá rud. Chuaigh frithchultúr na seascaidí go háirithe i bhfeidhm air. Chuir Milk 11 mhí isteach in oifig agus bhí sé freagrach as dhlí dhian i bhfeidhm le cearta LADT a chosaint sa chathair úd. Ar 27 Samhain 1978, d'fheallmharaigh Dan White Milk agus an Méara George Moscone. Maoirseoir eile de chuid San Francisco a bhí in White, a bhí i ndiaidh éirí as a phost ar bhord na cathrach agus a raibh teip ar a iarracht chun an post a fháil ar ais. In ainneoin giorracht an ama a chaith sé in oifig, d'éirigh Milk ina íocón in San Francisco agus ina martíreach. Sa bhliain 2002, rinneadh cur síos ar Milk mar "an t-oifgeach LADT is cáiliúla agus is suntasaí dár toghadh riamh sna Stáit Aontaithe." Rugadh Milk in Woodmere, Queens, Nua-Eabhrac, do thuismitheoirí Giúdacha de shliocht Liotuánach. Bhíodh pháistí eile ag spochadh as go minic mar gheall ar a dhá mhórchluas, a shrón mhór agus na spága de chosa a bhí aige. D'imir sé peil Mheiriceánach ar scoil dó agus bhí dúil a anama aige sa cheoldráma. Thuig sé mar dhéagóir gur homaighnéasach é féin ach choimeád sé é sin i gceilt. D'fhreastail sé ar Ollscoil Stát Nua-Eabhrac in Albany agus bhain sé céim bhaitsléara amach sa Mhatamatic. Le linn Chogadh na Cóiré sna luath 1950idí, bhí ar seirbhís i gCabhlach na Stát Aontaithe ar bord an USS Kittiwake, fomhuireán, agus mar theagascóir tumadóireachta. I ndiaidh an chogaidh d'éirigh sé mór le cúpla fear eile agus d'oibrigh sé mar staitisteoir i gCathair Nua-Eabhrac. Chaith sé tamall in Dallas, Texas freisin, sular chuir sé faoi in San Francisco. Sa bhliain 1971 chuir seisean agus a chomrádaí siopa ceamaraí ar bun leis na $1,000 dollar deireannacha a bhí fágtha acu. Tugadh an leathanach seo cothrom le dáta an 4 Nollaig 2016 ag 03:33.